At GNLD, we understand that a nutrient is not an isolated entity performing one simple little task. Instead, each nutrient depends on the presence of many others to perform its functions in the body. For instance, the body may use a single nutrient as a component of 300 different enzymes it manufactures, and each of those enzymes in turn requires a different mixture of nutrients! If key nutrients or any of their helper nutrients are missing or scarce, the body’s ability to function normally becomes compromised. Our in-depth nutritional knowledge enables us to take a comprehensive approach to GNLD product development. When formulating a supplement, for instance, our nutritional experts evaluate all of the related nutrients that must be available to ensure maximum utilization of the supplemental nutrient. We also pay attention to what happens to each nutrient as it passes through the body’s metabolic machinery. Similarly, we make sure the supplement is capable of delivering optimal nutrition which individual cells can utilize. This adage helps us visualize the body’s nutritional needs. So often when people use the term nutrition, they automatically think of vitamins. 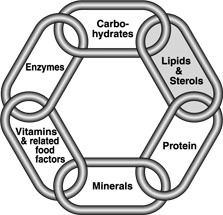 But many different nutritional “links” are required to keep the “Chain of Life” strong - protein, carbohydrates, lipids/sterols, enzymes, minerals, vitamins, and related food factors such as phytonutrients. 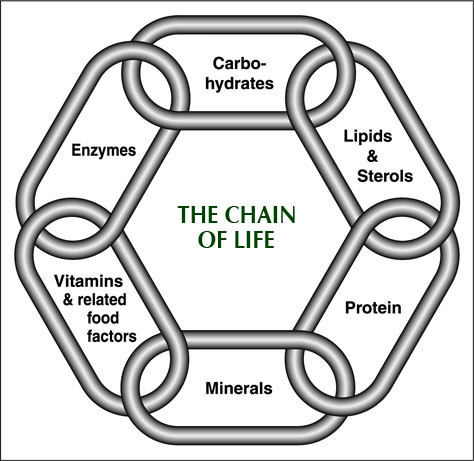 If even one link is weak, the overall “Chain of Life” can weaken as well. The result? The body’s metabolic machinery may not run as well as it should. Over time, health and vitality become compromised. 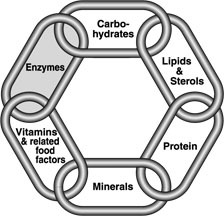 The strength of one “link” in the nutritional “Chain of Life” often depends upon the strength of another “link.” For example, before vitamins can be utilized efficiently in the body, minerals must be present. In fact, for optimum functioning throughout the body, all six nutrient groups must be presented in sufficient quantities and in proper balance. Only then can a complete, strong nutritional “Chain of Life” exist. Protein accounts for about three-fourths of the dry matter in human tissues other than fat and bone. It’s a major structural component of hair, skin, nails, connective tissue, and body organs. It’s required for practically every essential function in the body. For instance, a transport protein (haemoglobin) carries oxygen throughout the body, whereas a regulatory protein (insulin) regulates blood sugar level. Contractile proteins (actin and myosin) regulate muscle function, and immunological proteins (antibodies) protect the body against microbial invaders. Very small proteins (peptides) act as hormones and neurotransmitters to relay chemical messages throughout the body. While protein is used mostly to build and repair tissues, it can also be used for heat and energy, as one gram of protein yields four calories of energy. However, if adequate fat and carbohydrates are available, the body will spare protein from this energy function. Like the gasoline that keeps our cars running, carbohydrates keep our bodies running. Known as “the fuel food,” carbohydrates provide an inexpensive and readily-available source of energy to sustain life. Foods contain three basic types of carbohydrates: sugars, starches, and fibre. Sugars are simple carbohydrates that provide quick energy and are easily used by the body - examples include glucose, fructose, galactose, sucrose (table sugar), and lactose (milk sugar). Starches, on the other hand, are complex carbohydrates which require lengthier digestive action before they can be utilized. For this reason, they are consumed for sustained energy. Lastly, dietary fibre - carbohydrates which are so complex they are indigestible - contributes little or no energy, although fibre provides other important functions. Enzymes are proteins that speed biochemical reactions while remaining unchanged in the process. The body cannot carry out chemical reactions at body temperature without their help. Without these biological catalysts, chemical reactions would occur so slowly that life as we know it could not exist. With them, chemical reactions can occur at rates as much as 10 billion times faster than would be possible without enzymes! Enzymes are critical to digestion and metabolism. Just as keys are necessary to unlock doors, enzymes are required to release nutrients from foods so they can be absorbed and utilized by the body. If enzymes are not present in sufficient quantities, complete digestion cannot take place. Enzymes also keep the body’s metabolic “machinery” running smoothly. In turn, vitamins and minerals are essential for proper enzyme functioning. Vitamins are substances (derived from plants and animals) which are required in small amounts for normal body function. With few exceptions, the body cannot manufacture them, so they must be ingested in foods or supplements on a regular and continuous basis. Vitamins are either water-soluble (B-complex vitamins, vitamin C) or fat-soluble (vitamins A, D, E, and K). Consumption of insufficient amounts of vitamins can lead to deficiencies. Physical and emotional stress can also deplete the body’s vitamin reserves. The amount of a vitamin necessary to prevent the appearance of deficiency symptoms in healthy people is called the Recommended Dietary Allowance (RDA). Like vitamins, phytonutrients (nutrients from plants) are food-related factors required for optimal health. They include carotenoids from carrots, tomatoes, spinach, and other foods; flavonoids from grapes, berries, teas, etc. ; cruciferous compounds from broccoli, Brussels sprouts, and other cruciferous vegetables; sulphur-bearing compounds from garlic and onions; mucopolysaccharides from aloe vera; isoflavones from soybeans - the list goes on and on. Scientists have only in recent decades begun to understand the many different ways phytonutrients benefit health. Some phytonutrients, for instance, are potent antioxidants. Others boost the production of enzymes that detoxify dangerous substances. Like vitamins, minerals are absolutely critical to normal body function. Minerals make up 4-5% of our body weight and are present in the body in large amounts as “macrominerals” such as calcium, chlorine, phosphorus, potassium, magnesium, sodium, and sulphur, or in minute quantities as “microminerals” or “trace minerals” such as chromium, copper, fluorine, iodine, iron, manganese, molybdenum, selenium, and zinc. Important building blocks of bones, teeth, soft tissue, muscle, blood, and nerve cells, minerals are crucial to muscle response, nervous system communication, digestion, metabolism, and production of hormones and antibodies. They regulate the balance of water, acids, bases, and other biologically important substances in the body, and are crucial components of our enzyme systems. Though all minerals have their origins as components of earth, soil, and rock, some are bound within living organisms. Both earth-sourced minerals and those sourced from living organisms are found in our food supplies. In general, the body does not absorb minerals efficiently. As mentioned above, vitamins and minerals work better when taken in combinations than alone. Again, greater-than-RDA amounts of some minerals may be needed for optimal health. Lipids and sterols are fats which are essential to life. They provide energy and house fat-soluble vitamins and many phytonutrients. Phospholipids are structural components of cell membranes, emulsifiers, and precursors of acetylcholine, an important neurotransmitter. Other lipids, such as omega-3 and omega-6 fatty acids, are essential to health, playing roles in brain development and controlling inflammation. Sterols are a class of lipids which include precursors of certain hormones, cholesterol (a component of all animal cell membranes), and precursors of vitamin D. Together, lipids and sterols make up most of the two-layered “blanket” that surrounds every cell in the body. They are especially important components of the fatty tissues of the nervous system. Without properly balanced lipid/sterol levels, cells can become malnourished, which can lead to cellular fatigue. Lipids and sterols play a vital role in the assimilation of nutrients by the cell. If cells are unable to assimilate the nutrients they need, no amount of available nutrients will result in optimal nutrition. Likewise, unbalanced lipids/sterols may suppress endocrine gland function, further contributing to fatigue. While all cell membranes need fats, not all fats are created equally. There are good fats and bad fats. For example, saturated fats, such as those in beef and butter, are more rigid cellular “building blocks” than are unsaturated fats, such as olive oil and omega-3 fatty acids. Many scientists believe that membranes built with more pliable building blocks may be better able to retain their elasticity and their discretionary power to let in the good substances and keep out the bad. How Strong are the Links in Your Nutritional Chain of Life? Most nutritionists would probably agree that if we had the time to plan, prepare, and eat three complete meals a day, we would probably be able to satisfy the requirements for a strong “Chain of Life.” The problem is that few of us have the knowledge or the time necessary to ensure proper nutrition. As a result, we have no way of knowing just how strong the links are in our nutritional “Chain of Life.” For millions of people around the world, nutritional supplementation provides the assurance that all of the body’s nutrient requirements are being met daily. Despite our best intentions, dietary gaps are a fact of life that weaken the “links” in our “Chain of Life.” Smart supplementation can help fill nutritional gaps, and GNLD’s products are carefully formulated to strengthen all the links in the Chain of Life so you can achieve and maintain optimal health and vitality. Backed by years of scientific research and development, GNLD products are a way to assure that your nutritional “Chain of Life” is as strong as it can be. More than just vitamins and minerals, GNLD supplements provide a balance of essential nutrients to help you take charge of your health!